A unique quality of life that only Bulverde/Spring Branch can offer! 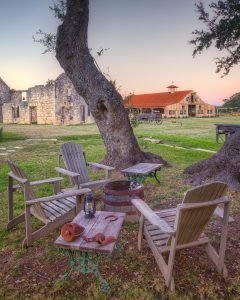 Spectacular Hill Country Living At Its Finest! 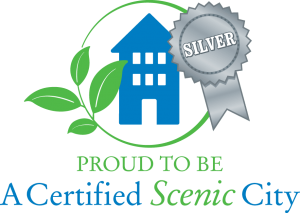 In July 2017, the City of Bulverde was selected as 1 of 13 Texas municipalities to be awarded Scenic City Certification through the Scenic City Certification Program, a project of Scenic Texas. The Scenic City program supports and recognizes cities for commitment to high-quality scenic standards for public roadways and public spaces. Five cities were certified for the first time—including Bulverde. The Bulverde/Spring Branch Area is rich in history and offers a wide variety of outdoor activities and attractions such as the Guadalupe River State Park, Honey Creek State Natural Area, Upper Guadalupe River and Canyon Lake. Community highlights include The Old Village of Bulverde (fondly referred to by locals as “The Village” and is located in historic downtown Bulverde which was founded in 1850 and known as the Pieper Settlement), Anhalt Hall (a Germania Farmer Verein established in 1875), the historic Knibe Ranch & Events Center (a Century Heritage Ranch established in 1852), Guadalupe Canoe Livery and Campground (est. 1971 that offers camping and canoe, kayak, raft or tube trips on the Upper Guadalupe River w/o any of the New Braunfels restrictions. 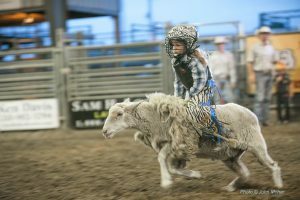 ), The 1850 Settlement (an events venue featuring the first home built in Bulverde), Tejas Rodeo Company, Bulverde Community Center, Bulverde/Spring Branch Activity Center, and the new Bulverde Community Park. And, Bulverde/Spring Branch is not without its share of well-known eateries, local watering holes, and related venues such as Richter’s Antler Cafe, Wine 101, Shade Tree Saloon & Grill, Max’s Roadhouse, Dry Comal Creek Winery & Vineyards, Rebecca Creek Distillery, The Reel Seafood House, Papa Gallos Mexican Restaurant, Beefy’s Backyard, Beefy’s on the Green, Hatch 5 Market, Castle Avalon, Boulder Springs Event Center, Lost Mission, and many, many more. To learn more about our fabulous community, please visit our Bulverde/Spring Branch Area Chamber of Commerce Community Guide by clicking here. Bulverde/Spring Branch is located north of San Antonio, west of New Braunfels, east of Boerne and south of Blanco…strategically located approximately 22 miles or less from each in all directions. Bulverde/Spring Branch is within minutes to most major attractions and venues throughout the Greater San Antonio-New Braunfels Metropolitan Statistical Area (MSA) such as Schlitterbahn Water Park & Resort, Historic Gruene, Natural Bridge Caverns and Wildlife Ranch, Cascade Caverns, Cave Without A Name, San Antonio River Walk, San Antonio Zoo, Hemisfair Park, Sea World San Antonio, Six Flags Fiesta Texas, and Morgan’s Wonderland and Inspiration Island to name just a few. Bulverde/Spring Branch provides a small town life near the big city with friendly people and lots of local activities from hiking, tubing, and shopping. We are a great place for families and to raise kids! For more information about what the Bulverde/Spring Branch area has to offer, please visit the various pages of our website. 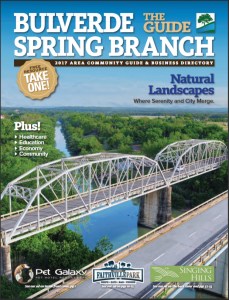 You can also visit the Bulverde/Spring Branch Area Chamber of Commerce’s 2017 Community Guide by clicking here.